POLICY MATTERS OHIO REPORTS: WHAT IS THE STATE OF WORKING OHIOANS? “Women continue to earn less than men in Ohio, although in 2017 women’s median wages rose slightly (from $15.85 to $16.15) while men’s slid a bit (from $19.38 to $19.29). Still, men earn more than $3.00 more each hour than women do, translating to more than a $6,500 difference with full-time year-round work. This disparity has improved dramatically over the nearly 40 years of this analysis, due both to rising women’s wages and shrinking men’s wages at the median, when adjusted for inflation. 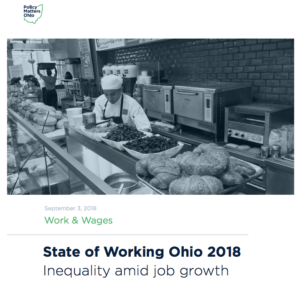 Policy Matters’ report explores the state of workers in Ohio, and highlights policy recommendations to support economic prosperity. These policies are crucial to working women who play important roles as primary, sole, or co-breadwinners for nearly two-thirds of Ohio households. [Read the full report here]. 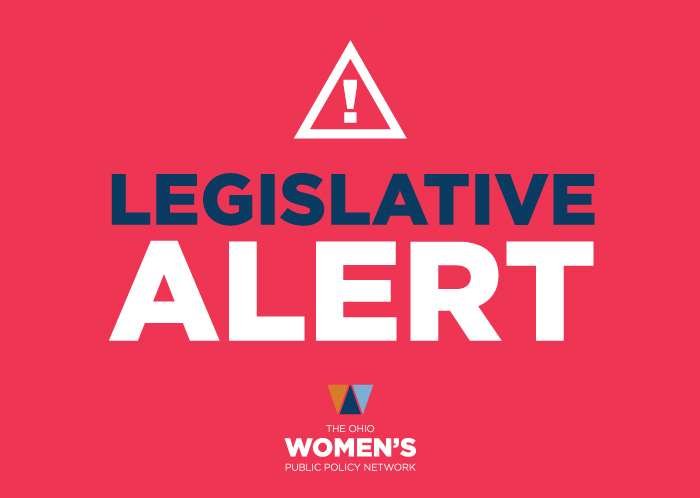 We are tracking the progress of any state bills affecting women in the Ohio Legislature for the 132nd General Assembly. The House and Senate were out last week and will also be out this upcoming week for summer recess; there are no new updates. The Senate confirmation hearings for Judge Brett Kavanaugh may be over, but we still need Ohioans to stand up and speak out against his nomination to the Supreme Court. During the hearing, disclosed emails revealed that Kavanaugh suggested Roe v. Wade was not settled law. Throughout Trump’s presidential campaign, he vowed to appoint only pro-life Judges who would overturn Roe v. Wade and dismantle the Affordable Care Act (ACA). Now, that threat is very real. Kavanaugh’s nomination would be disastrous for women – particularly women of color. There is too much at stake to sit on the sidelines. 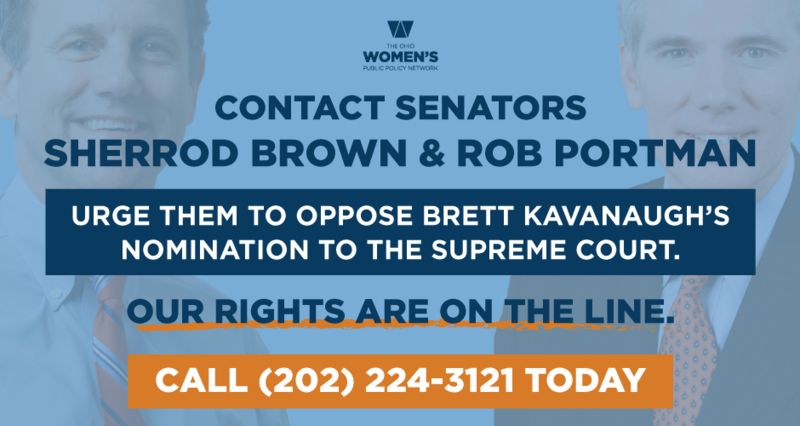 Call (202) 224-3121 to connect with Ohio Senators Sherrod Brown and Rob Portman. Urge them to stand with Ohio women and reject Kavanaugh. Kavanaugh’s nomination threatens to shift the balance of the courts and he has proven that he will not stand up for the constitutional rights of women. He would fundamentally shift the balance of the courts against women, workers, LGBTQ people, and communities of color. Use our Supreme Court Toolkit to make your voice heard. The Violence Against Women Act (VAWA) is one of the nation’s primary tools in addressing domestic violence, dating violence, sexual assault, and stalking. The bill is up for re-authorization this year, and is set to expire on September 30, 2018. The VAWA re-authorization bill provides critical protections for survivors of domestic violence, sexual violence, and stalking. But it needs your help to ensure passage before the September 30 deadline. If your Representative has not signed on as a co-sponsor of the Violence Against Women Reauthorization Act of 2018 (H.R. 6545), urge them to do so immediately. If your Representative has are already signed on as a co-sponsor to H.R. 6545, thank them for doing so.